Oregon Scientific. The global brand of lifestyle consumer products. Oregon Scientific was founded in 1989 in Portland,Oregon,USA,a blissful place buzzing with ideas and inventions. Complimenting this exciting atmosphere was a beautiful and vibrant backdrop of nature. It was from this unique balance that Oregon Scientific has nurtured the concept of “SMART LIVING”. Oregon Scientific is backed by IDT International Limited,one of the world's leading electronics manufacturers.From time to time,our innovative in-house design and product development teams work seamlessly to achieve technological innovation and design excellence.Each product we create implies vital value to human life. 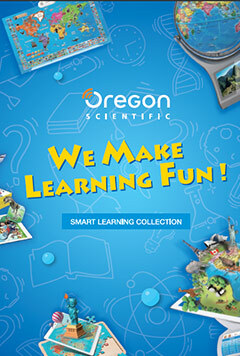 With the support of a strategic marketing team,Oregon Scientific successfully spread our products with beneficial“SMART LIVING”concept worldwide. Nowadays,we have become one of the world-renowned brands that continues to produce cutting-edge lifestyle consumer electronics and gadgets to enhance people's daily life.